The Place Nested in the middle of Circular Road in Boat Quay, Dojo takes on the industrial chic design with a good split between both indoor and outdoors seats. Well located within the Central Business District, we can literally hear the white collar workers exclaim “Yes!”. Finally a gourmet burger worth our calories invaded our work place and for better or worse, make us sin! 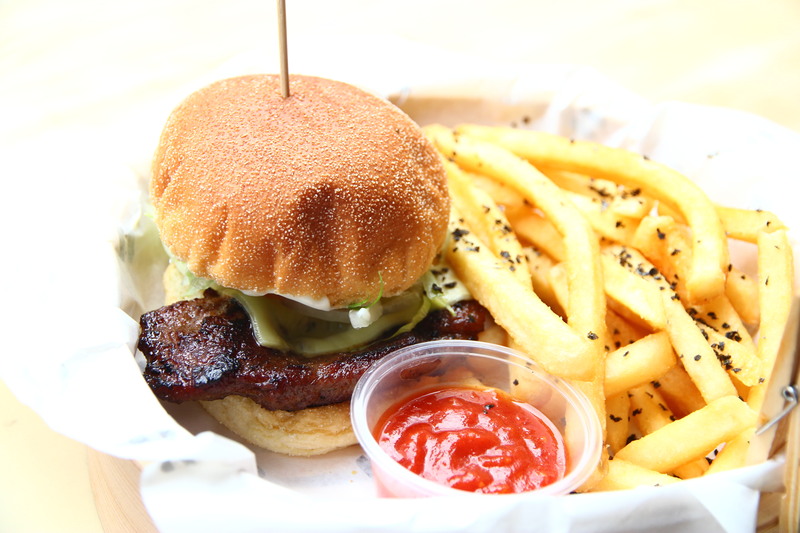 “Dojo” is traditionally referred to as schools where martial arts were taught, which is the inspiration behind the current Dojo’s owners to ensure their restaurants upkeep the high standards and consistent quality as the “place of the way” for Burgers in Singapore! Free & easy style for takeaways – order your food, grab your drink and join the queue. For dine in, simply wait for your buzzers to ring before collecting your freshly made burgers from the kitchen! The Food The burger names are Japanese fighters inspired, with familiar names such as Ninja and Sumo, to fun geeky gamers inspired names such as Big Boss and Hadoken. Snapshot of the menu below, although you would likely not know what ingredients each burger is made from their unrelated names! Just so you know, all orders comes in a set, which includes the Burger, Fries and a Drink! First up, Komba Bao ($6)! Sounds familiar to the traditional Kong Bak Bao (扣肉包)?! That’s because it is so Singapore-styled inspired, with the buns deep fried and stuffed with grilled pork! This was truly sinful, and honestly good. Make sure you give this a try! Okay, now on to the Burgers! Definitely one of our top choices just merely looking at the fillers, from Mushroom to Melted Cheese, Kaiju ($12) seems almost perfect. And it is. Have we not yet mentioned that Dojo is a pork theme burger joint? One of their best sellers, this Little Dragon ($13) had the perfectly grilled pork steak, coupled with melted cheese, lettuce, tomatoes. Savour this hot, and have no qualms of getting your hands dirty while eating. Somehow it just tasted better that way! If you happen to come here with a couple of colleagues, do order the Pork Grillets ($6) as a side as well. Well marinated, this chunk of grilled pork slices simply melts in the mouth. Another one of our must try here, but be warned – you would want to plan your work out session after the meal! We were not satisfied with just the above, so we decided to try them all! Sumo ($13, far right) has it all, literally. From the pork patty to roasted sesame sauce to crispy batter-fried pork belly (aka fried bacon) and crunchy salad, this is one burger you would not be able to down in a mouth-full. We like the mix of ingredients, but it seemed a little overwhelming for a burger. As for Hadoken ($12, forefront), the pork patty was done with spicy Asian chilli sauce, diced onions, cheese and bacon strips. Don’t expect this to be really spicy, it was more aptly coined as sweet curry instead! Verdict: Our favourite burgers were the Hadoken and Little Dragon! Rants We didn’t quite fancy the fries, which was a tad too bland for us, or maybe we are more accustomed to heavily seasoned fries. Will I return again? We all love burgers, don’t we? Dojo puts in some good effort in offering a myriad of permutations to the usual plain pork-patty Burger, with 8 funky selections to choose from. While it might not exactly be the top gourmet burger joint around, but at the affordable price, we are definitely Dojo-ing again soon! And to tRP readers, may the Pork be with you! I hear they have a new burger on the menu now called Fowl Play, which is a chicken burger! The only burger they have that isn’t pork! You should get back to try it!